Definition at line 45 of file llhudeffectbeam.h. Definition at line 53 of file llhudeffectbeam.cpp. References BEAM_SPACING, f, i, llmin(), LLHUDEffect::mDuration, mFadeInterp, mInterp, mInterpFade, mKillTime, NUM_POINTS, S32, LLInterp< Type >::setEndTime(), and LLInterpLinear< Type >::start(). Definition at line 79 of file llhudeffectbeam.cpp. Definition at line 83 of file llhudeffectbeam.cpp. References _PREHASH_TypeData, LLMessageSystem::addBinaryDataFast(), htonmemcpy(), llendl, llwarns, LLVector3d::mdV, LLHUDObject::mSourceObject, LLHUDObject::mTargetObject, mTargetPos, MVT_LLUUID, MVT_LLVector3d, and LLHUDEffect::packData(). Definition at line 231 of file llhudeffectbeam.cpp. References f, F_PI, gAgent, LLInterpLinear< Type >::getCurFrac(), LLFrameTimer::getElapsedTimeF32(), LLAgent::getPosAgentFromGlobal(), LLAgent::getPosGlobalFromAgent(), glColor4ubv, glPopMatrix, glTranslatef, gSphere, i, LLHUDObject::markDead(), LLHUDEffect::mColor, mFadeInterp, mInterp, mInterpFade, mKillTime, LLHUDObject::mSourceObject, LLHUDObject::mTargetObject, mTargetPos, mTimer, LLVector3::mV, LLColor4U::mV, LLPointer< Type >::notNull(), NUM_POINTS, LLSphere::render(), S32, setupParticle(), LLImageGL::unbindTexture(), and LLHUDEffect::update(). Definition at line 177 of file llhudeffectbeam.cpp. References gAgent, LLAgent::getPosGlobalFromAgent(), LLJoint::getWorldPosition(), i, LLViewerObject::isDead(), llendl, llwarns, mInterp, LLHUDObject::mSourceObject, LLVOAvatar::mWristLeftp, NULL, NUM_POINTS, S32, LLInterp< Type >::setStartVal(), and LLInterpLinear< Type >::start(). Definition at line 215 of file llhudeffectbeam.cpp. References llendl, llwarns, and LLHUDObject::mTargetObject. Definition at line 225 of file llhudeffectbeam.cpp. References LLHUDObject::mTargetObject, mTargetPos, and NULL. Definition at line 359 of file llhudeffectbeam.cpp. 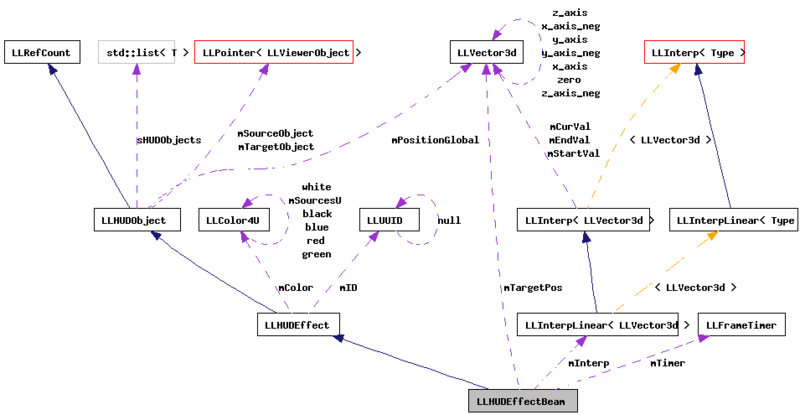 References BEAM_SPACING, f, gAgent, LLAgent::getPosGlobalFromAgent(), LLJoint::getWorldPosition(), ll_frand(), LL_PCODE_LEGACY_AVATAR, mInterp, mInterpFade, LLHUDObject::mSourceObject, mTargetPos, LLVOAvatar::mWristLeftp, NUM_POINTS, LLInterp< Type >::setEndTime(), LLInterp< Type >::setEndVal(), LLInterp< Type >::setStartTime(), LLInterp< Type >::setStartVal(), LLInterpLinear< Type >::start(), x, y, and z. Definition at line 122 of file llhudeffectbeam.cpp. References _PREHASH_Effect, _PREHASH_TypeData, f, LLViewerObjectList::findObject(), LLMessageSystem::getBinaryDataFast(), LLFrameTimer::getElapsedTimeF32(), LLMessageSystem::getSizeFast(), gObjectList, htonmemcpy(), llendl, llerrs, llmin(), llwarns, LLUUID::mData, LLHUDEffect::mDuration, LLVector3d::mdV, mFadeInterp, mKillTime, mTimer, MVT_LLUUID, MVT_LLVector3d, S32, setSourceObject(), setTargetObject(), setTargetPos(), size, and LLHUDEffect::unpackData(). Definition at line 54 of file llhudeffectbeam.h. Definition at line 70 of file llhudeffectbeam.h. Referenced by LLHUDEffectBeam(), render(), and unpackData(). Definition at line 68 of file llhudeffectbeam.h. Referenced by LLHUDEffectBeam(), render(), setSourceObject(), and setupParticle(). Definition at line 69 of file llhudeffectbeam.h. Referenced by LLHUDEffectBeam(), render(), and setupParticle(). Definition at line 66 of file llhudeffectbeam.h. Definition at line 71 of file llhudeffectbeam.h. Referenced by packData(), render(), setTargetPos(), and setupParticle(). Definition at line 67 of file llhudeffectbeam.h.